DAY 1 � Friday, 26th July This morning we will depart from Dublin to Naples. Upon arrival we will enjoy our first glimpses of the Italian countryside as we drive to the town of Pietrelcina, birthplace of St. Pio. After free time for lunch we will celebrate the opening Mass of our pilgrimage and afterwards have a walking tour of the quaint town visiting the home of the Forgione family where Padre Pio was born, the Church of Sant �Anna where he was baptised and the church where he celebrated his first Mass. We will travel to nearby Piana Romana where we will see the humble farmhouse of the Forgione family and have time for prayer before the tree beneath which Padre Pio received the invisible stigmata. We will enjoy the contrasting landscapes as we make our way to our destination of San Giovanni Rotondo where we will stay in the four-star San Giovanni Rotondo Palace Hotel for the following four nights (3 nights full board / 1-night half board). DAY 2 � Saturday, 27th July This morning we will celebrate Mass in the ancient church of Our Lady of Grace where St. Pio celebrated Mass, heard confessions and received the gift of the stigmata. Afterwards we will visit the English Office where we will hear more of the life of St. Pio and receive a blessing with the glove and crucifix of the humble friar. In the afternoon we will follow in the footsteps of St. Pio during his time in San Giovanni Rotondo with a visit to the capuchin friary where we will see the cell occupied by the capuchin friar and the crucifix before which he received the stigmata. We will end our tour with a visit to the Church of St. Pio of Pietrelcina where we will have time for private prayer before the mortal remains of this great saint of our time. DAY 3 � Sunday, 28th July We will celebrate Mass this morning at the hospital, �Casa Sollievo della Sofferenza� considered Padre Pio�s greatest creation. Afterwards we will walk the Way of the Cross, which allow us, as Christians, to pause and enter reflectively into those last moments of Jesus�s journey of love. This afternoon we will visit the capuchin friary of Sant�Anna in Foggia, Padre Pio�s last stop before arriving in San Giovanni Rotondo. We will see the cell occupied by the friar and have time for prayer in the church where Padre Pio celebrated Mass. DAY 4, Monday, 29th July This morning we will travel to the town of Monte Sant�Angelo and celebrate Mass at the Shrine of St. Michael the Archangel, the oldest shrine in Western Europe dedicated to the Archangel Michael. Afterwards we will have time at leisure for shopping and private sightseeing before returning to San Giovanni Rotondo for lunch. We will have the afternoon at leisure with the opportunity for the sacrament of reconciliation and private prayer. 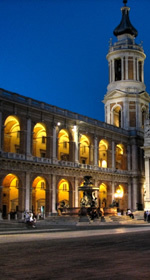 DAY 5 � Tuesday, 30th July This morning we will depart San Giovanni Rotondo and travel to the town of Manopello to visit the Basilica of the Holy Face. Here we will venerate the mysterious cloth believed to display the true image of Our Lord's Face imprinted on the Veil of Veronica. After free time for lunch we will continue onto Cascia, home to St. Rita for over forty years. We will check into the four-star Hotel Monte Meraviglia and afterwards celebrate Mass in the Basilica of St. Rita. 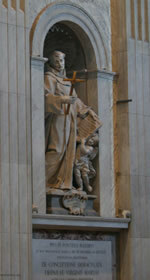 DAY 6- Wednesday, 31st July This morning we will visit the town of Roccaporena, birthplace of St. Rita. We will learn about the life of St. Rita as a mother and widow and visit the Rose Garden where we will hear about the famous miracle of the Rose and two figs. We will continue onto Assisi and check into the Hotel Domus Pacis where we will stay for two nights on a half board basis. After free time for lunch we will celebrate Mass in the Basilica of Santa Maria degli Angeli, visit the chapel of the Porziuncola and see the chapel of the Transito where St. Francis died. DAY 7 � Thursday, 1st August This morning we will celebrate Mass at the Basilica of St. Francis and afterwards enjoy a tour of the basilica as we admire the frescoes and wonderful works of Giotto, Cimabue and Simone Martine. We will have a walking tour of the medieval town of Assisi which will include a visit to the Basilica of St. Clare, founder of the Order of the Poor Clares. The remainder of the afternoon we will have at leisure for shopping and private sightseeing. DAY 8 � Friday, 2nd August After breakfast we will depart Assisi and drive to Rome. 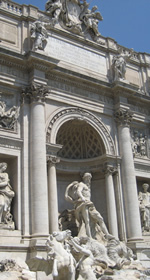 We will enjoy a guided tour of St. Peter�s Basilica where we will see Michelangelo�s delicate Piet� statue, the canopy altar where the Pope celebrates Mass and the crypt of the Popes. After free time for lunch we will visit the 16th century Church of Santo Spirito in Sassia, now the Italian shrine of devotion to Divine Mercy, where we will recite the Divine Mercy Chaplet. We will have time for prayer before the image of the Merciful Jesus and statue of St. Sister Faustina Kowalska with her reliquary, donated by the Holy Father John Paul II after her canonization. Afterwards we will transfer to Ciampino airport for our return flight to Dublin as we return to our homes, filled with a sense of tranquility, rejuvenation and peace in our hearts.